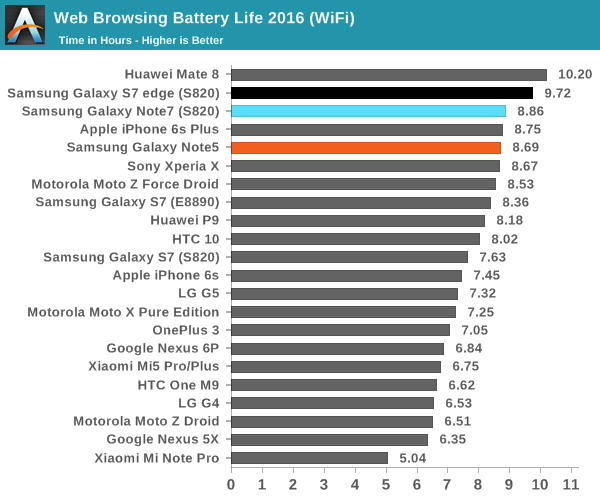 Obviously, battery life is one of the most important aspects of any smartphone, tablet, or other mobile device shipping today. 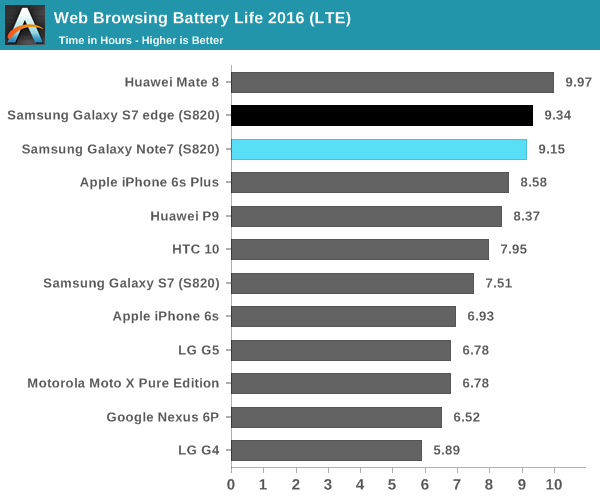 The main point of interest for a lot of people seems to be battery life as even though we’re approaching what might be considered a full day of use a lot of people seem to need quite a bit more as battery life demands can vary dramatically from day to day. If you sit in an office for much of your day with the phone next to a charger then battery life demands are going to be relatively light but if you have to deal with a 12 hour flight with a 2 hour wait for a transfer before another 4 hour flight then you’re probably going to find that most devices are not going to have the ability to get you through a full “day” if your day of use involves 9 hours of usage between movies, games, web browsing, and other data synchronization tasks. This is obviously an extreme case but if you’ve ever done a trans-pacific flight this isn’t that far-fetched if you can’t fall asleep for at least 10 hours of the ~16 hour flight. 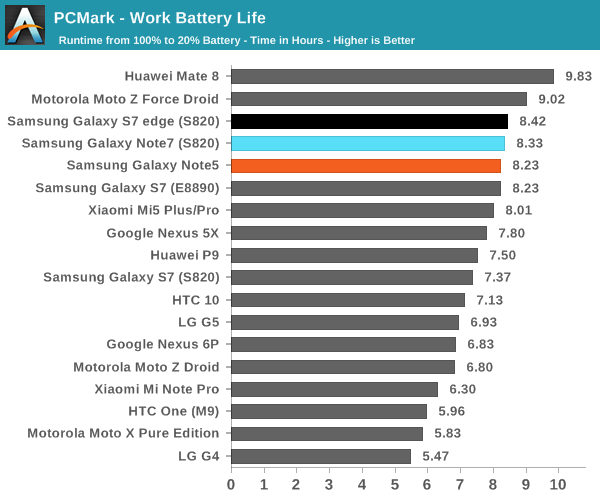 In order to try and test this properly then we turn to our 2016 suite of benchmarks which allow for proper characterization of battery life in fairly realistic workloads. In order to make for useful relative comparisons we disable all background tasks and set the display for all devices to 200 nits on a blank white screen for all tests. In the case of the Galaxy Note7 due to its similarity to the Galaxy S7 edge we’ve elected to run a compressed version of our suite although if time permits we’ll be adding additional results and commentary. With that said we can start with the WiFi test which shows about an 8% drop for the Note7 relative to the Galaxy S7 edge. This might be surprising to some but given that the display area of the Note7 is 7% larger and the battery is about 3% smaller it’s not all that surprising as I wouldn’t be surprised if literally everything but display has identical power consumption on the Galaxy Note7. While the WiFi test result is pretty much in line with expectation the LTE test result is visibly different and somewhat surprising to see. It’s tempting to explain the relative difference change away as a function of Verizon and T-Mobile LTE differences but reception was fairly comparable across both test units and both were tested on LTE. Given that the Note7 has 4x4 MIMO for cellular connectivity I suspect that there are some RF front-end changes that distinguish the Note7 from the S7 edge but the RF front-end is only visible to the modem rather than the overall system so unless the modem itself can be accessed I suspect the most viable method of figuring out the changes here will be a device teardown which isn’t in the scope of this review. The next point of interest is going to be PCMark which shows how close the Galaxy S7 edge and Note7 are in WiFi and CPU bound tasks as they last basically an identical amount of time and have fairly comparable performance if you get both on the same version of software. 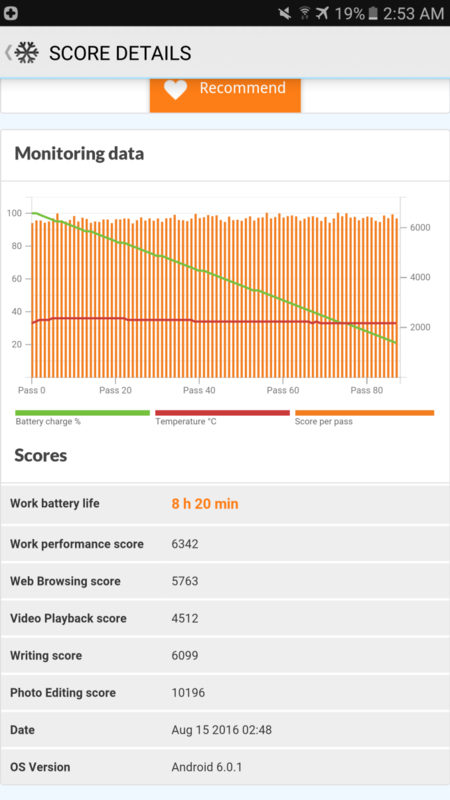 Due to time constraints I would refer back to the Galaxy S7 Part 2 Review if you are interested in seeing what heavy workload battery life is like, but overall the Galaxy Note7 keeps fairly good battery life even if it isn't as great as the Galaxy S7 edge. Of course, while battery life is critical we need to also talk about the other side of the equation which is how quickly it can charge. After all, if you’re stuck in an airport waiting for your connection and burn off most of your battery in the process, it’s going to be fairly painful conserving battery until you get to your destination because your phone can’t charge quickly enough to compensate for additional usage. 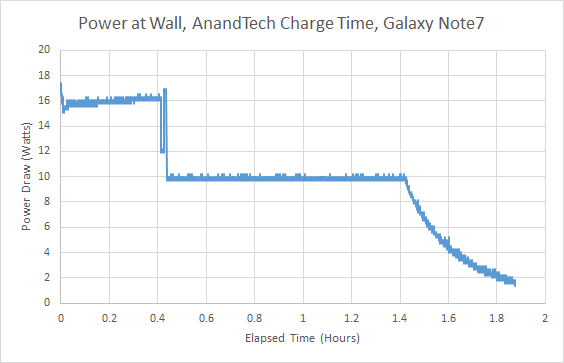 In order to test something like this, we rely on measurements from the wall and waiting until the power draw from the wall reaches a specified level that indicates full charge has been reached. In the case of the Galaxy Note7, the charger uses QC 2.0 or Samsung’s adaptive fast charge technology depending upon the AC adapter you’re using, and internally the battery charger IC is a TI BQ25898S which contains a buck converter that can take a 9V or 12V input and step it down to the appropriate voltage for the battery with supports for current up to four amps at roughly 90% efficiency. 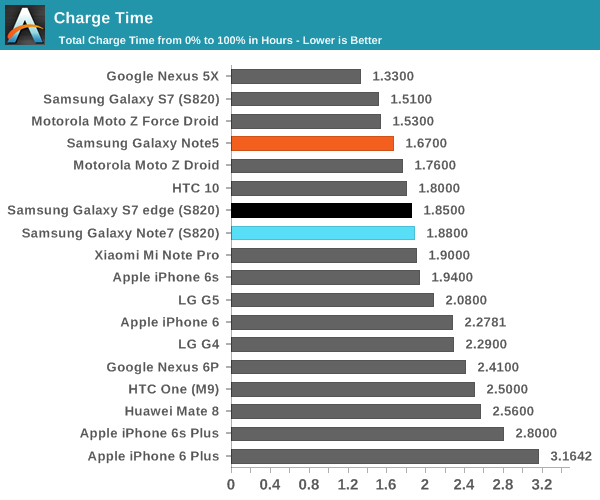 Looking at the overall charge time the Galaxy Note7 performs respectably as it reaches full charge in under two hours and takes basically as much time as the Galaxy S7 edge, which is probably not a surprise given their similar battery capacities. For the most part I think we’ve hit an upper bound here as far as charge time goes. The real challenge now is to focus on reducing the heat output and impact to battery longevity that these fast charging solutions have similar to OnePlus’ Dash Charge and Qnovo’s Adaptive Charging technologies. Buuutt... if you want to send me the HTC 10, I'll review it for you (badly).